- Faîtes l’Europe on the 8th and 9th of May. The event hosted associations working to promote active aging and intergenerational solidarity on the Town Hall square, in connection with the “Maison de l'Europe” in Paris (http://www.paris-europe.eu/spip.php?rubrique33). E-Seniors/E-Juniors was there to present its activities. 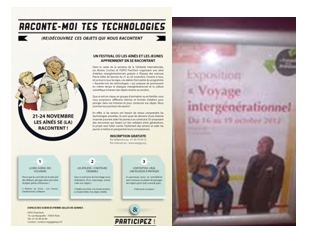 - Du faire pour au faire ensemble, conference for the associations providing solutions for an intergenerational society, organised by the association France Bénévolat (http://www.francebenevolat.org/actualite/187) on the 4th of December. 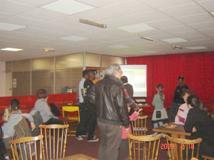 · on the 17th of October 2012, at the Town Hall of the 13th district of Paris, an intergenerational Kinect demonstration. Different generations were present to try the game, discuss, etc. · intergenerational activities in cooperation with the Atomes Crochus Association (http://atomes-crochus.org/). The goal is to bring together youth and seniors to get them to talk about technologies from their respective generations. · Les Deux Mémoires is an organisation dedicated to exploring and promoting intergenerational exchange through film. The filmmakers strive to document the individual experience in changing rural communities in order to promote unity between generations. One of the topics on which the team focuses is ageing Europe. · AGE Platform Europe is a European network of around 167 organisations of and for people aged 50+ which aims to voice and promote the interests of the 150 million senior citizens in the European Union and to raise awareness on the issues that concern them most. For more information, please visit the website: http://www.age-platform.eu. · European Map of Intergenerational Learning (EMIL) is a collaborative learning network that aims to provide a general overview of the role and status of intergenerational learning through collecting, exchanging, and distributing ideas and resources and by supporting regional, European and global networking strategies. EMIL brings together a range of partnerships promoting and supporting intergenerational learning in all its varied forms. For more information, please visit the website: http://www.emil-network.eu/.